FLORIDA -- A Broward Sheriff's Office deputy on Tuesday shot at an 80-pound pit bull terrier that lunged at a animal control officer who was trying to capture the snarling animal, authorities said. The dog, which had killed a cat and attacked a dog in the Silver Oaks Mobile Home Park in the 5900 block of Southwest 34th Street near Davie, leaped against a window on Broward County Animal Control Officer Lori Morris's truck, Animal Control Director Alan Davis said. The dog smashed the window and showered the frightened officer with shards of glass as Morris attempted to hook it with a catch pole, Davis said. Deputy Sue Sumrall fired one round at the dog but apparently did not injure the animal, which retreated to its yard, authorities said. "The dog was not shot," Davis said. "The dog was bleeding, but the veteranian seems to indicate he somehow got his toenail cut." The dog was later taken to the animal control compound, and investigators late Tuesday were trying to locate its owner, Sheriff's Office spokesman Jim Leljedal said. 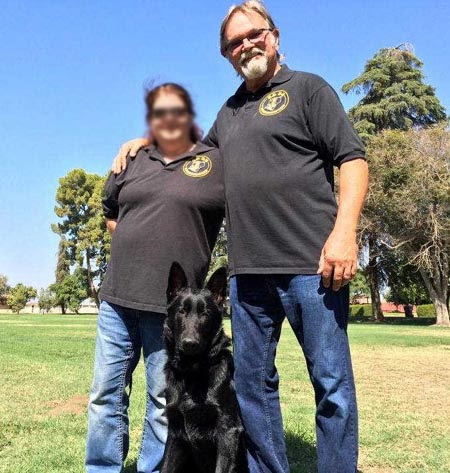 CALIFORNIA -- When it comes to guard-dog training, Bob Taylor says, "I'm the best." But Taylor's bravado was shaken Monday after he pleaded no contest in Orange County Municipal Court, Westminster, to training protection dogs without a license. Taylor, a well-known trainer who operates Superior Dog Training in county territory near Stanton, said he is the victim of a legal technicality and a nosy neighbor. The neighbor, Robert Keller, started things off when he complained to authorities that Taylor had mistreated dogs. Taylor said Keller imagined it. According to authorities, Taylor has every permit he needs to operate his kennel business but does not have a $250 protection-dog training license issued by the state Department of Consumer Affairs. But Taylor insisted that he performs no protection-dog training. 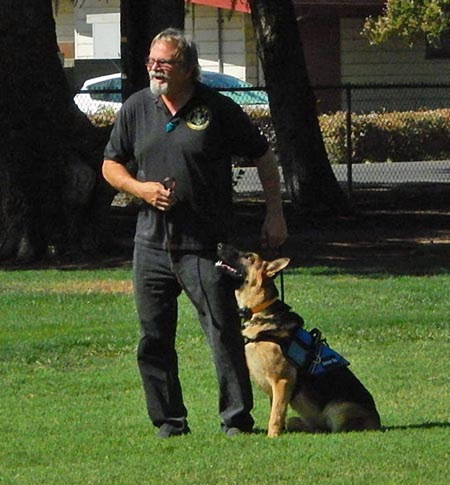 "I've used a much gentler alternative, and that's Schutzhund training," he said. He described Schutzhund training as a sophisticated German technique he has been using for years to train German shepherds, Doberman pinschers and other breeds. According to dog experts, Schutzhund does not involve "attack training," during which trainers in padded suits modify a dog's behavior by irritating the dog with a stick, prompting it to attack. But Deputy Dist. Atty. David R. LaBahn said Taylor plainly was training protection dogs. "I would put it to you, a jury or anyone else," LaBahn said, "if it looks like protection-dog training--that is, wearing the padded outfit and hitting with sticks--then it's consistent with protection-dog training." Taylor said his problems began several years ago, when Keller peered over Taylor's fence. Keller later said he saw Taylor mistreat a dog. He said that on other occasions he saw Taylor or Taylor's handler wearing padded dog-trainer's garb and hitting a dog with a stick to make it attack. Keller complained to the state Department of Consumer Affairs, which led to the criminal case. Taylor insisted that the case is a waste of tax money--"a lot of nothing"--but Monday he pleaded no contest to operating a business without a license, a misdemeanor. Municipal Judge Dan C. Dutcher fined Taylor $175 and placed him on two years' probation. As part of a plea bargain, the district attorney dropped charges of cruelty to animals and false advertising. This does NOT mean Taylor wasn't guilty of mistreating or abusing dogs. It simply means that in an effort to clear the case out, the prosecutor offered him a similar level crime to plead to. Taylor said Monday that Keller is motivated by jealousy over Taylor's successful business. Keller denied it. "He's just calling it by a different name," Keller said, "but it's still protection-dog training." Taylor accused the state Department of Consumer Affairs of splitting hairs about its definition of protection-dog training. The department denied it. "We've been at this with Mr. Taylor since 1983," said Ernest Luzania, deputy chief of the Bureau of Collection and Investigative Service in Sacramento. "He has always claimed that he wasn't doing training as the professions code defines protection-dog training. We are of the opinion that he was, and that's why we filed charges. "We're not splitting hairs, he is," Luzania said. Taylor said he was once told by Luzania's agency that he did not need a protection-dog license. He later applied for a license and was rejected because the agency had begun its investigation of Keller's claims, he said. Taylor said he will go before an administrative hearing judge today to appeal the agency's license denial. Update: Bob Taylor has been charged with felony animal cruelty (2017).